Cast perform the wedding scene during a rehearsal for the “Little Women” opera at the Coralville Center for the Performing Arts on Tuesday, April 9, 2019. The opera has showings throughout the weekend of April 12 for audiences to attend. Louisa May Alcott’s Little Women was transformed into an opera in 1998. 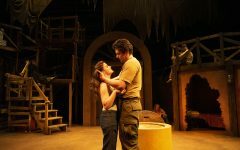 Presented by the University of Iowa School of Music, the opera will open at the Coralville Center for the Performing Arts April 12. How do you take an art form born in the 17th century and give it a modern flair? By throwing in an American classic and four dynamic women, of course. “Little Women,” a classic American novel written by Louisa May Alcott, follows four sisters growing up during and after the Civil War. The tale struck the hearts of Americans and remains there 150 years later. Numerous film and musical adaptations have been made, but only a single opera adaptation was ever created. 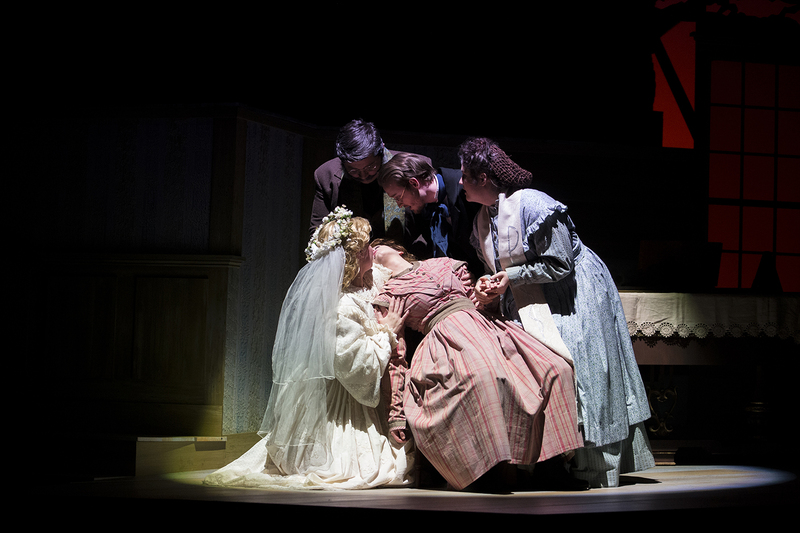 In 1998, Little Women Opera came to life through composer Mark Adamo. 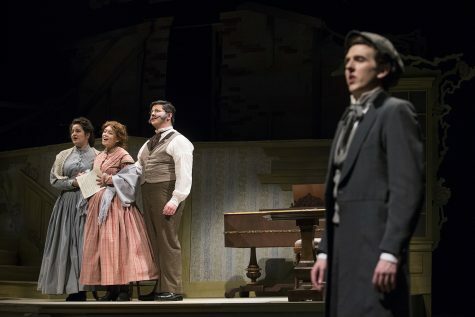 The University of Iowa School of Music will present Little Women (Opera) at the Coralville Center for the Performing Arts on Friday through April 14, with shows Friday and Saturday at 7:30 p.m. and a matinee at 2 p.m. April 14. Needless to say, the arts have enjoyed capturing “Little Women” from varying artistic methods and angles. 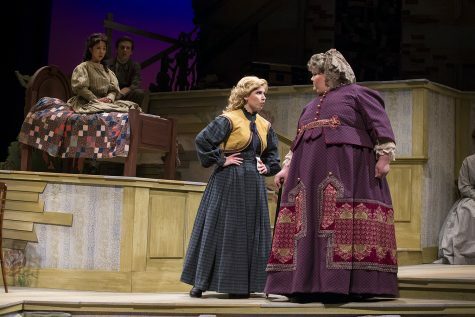 Shelby Tipling (left), playing Meg, and Norah Wolfe, playing Cecilia, perform during a rehearsal for the “Little Women” opera at the Coralville Center for the Performing Arts on Tuesday, April 9, 2019. The opera has showings throughout the weekend of April 12 for audiences to attend. Unlike a majority of operas, Little Women slides into the contemporary genre and is sung in English, bridging the divide between the old and new. Little Women is a coming-of-age story that shines a light on the challenges, happiness, heartbreak, and change that Meg, Jo, Beth, and Amy March go through after the Civil War. Change, and the negative feelings Jo March has toward the word and what it brings, plays a principal role in the novel and show. Jo is the prominent sister of the story because the show is made to seem as though the novel was written by her. 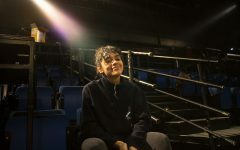 Stage lights will shine on the character for Jo since she rarely leaves the stage. Cast perform during a rehearsal for the “Little Women” opera at the Coralville Center for the Performing Arts on Tuesday, April 9, 2019. The opera has showings throughout the weekend of April 12 for audiences to attend. Both sisters clash over their polarizing personalities and societal opinions. Jo and Amy are asked whether they believe marriage is good for a woman, Amy replies with, “I think marriage is the best possible thing for a woman.” Jo exclaims, “I think marriage is the worst possible thing for a woman.” Arguments ensue with peace hopefully on the auditorium’s stage-lit horizon. Delving into the March family’s world of the post-Civil War era required more than Alcott’s writing. 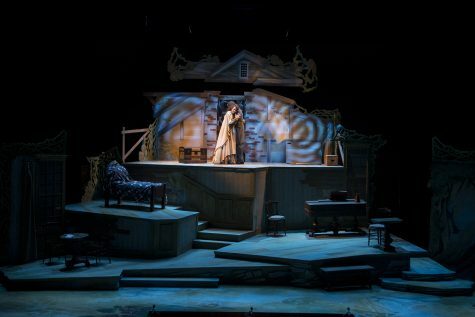 A set true to its time was constructed into a colonial-style house based on Alcott’s home, as her beloved story’s foundation lies between Alcott and her sisters. While the period of late-1860s, early 1870s is long in the past, the March household is speckled with relatable features. Cast sing during a rehearsal for the “Little Women” opera at the Coralville Center for the Performing Arts on Tuesday, April 9, 2019. The opera has showings throughout the weekend of April 12 for audiences to attend. In noncontemporary operas, the number of roles available for women were minimal or seldom beckoned for anything other than sopranos. But the novel of “Little Women,” written in times of extensive inequality, now adjusts the rules of the opera game in a modern era. Populations of the 21st century receive their entertainment quickly, but that doesn’t mean older novels and art forms are not fit to entertain audiences in 2019.